Social monitoring is something that tends to be forgotten among brands. Yet still, what your audience is saying on social media is extremely important, and if you aren’t listening to it, you’re missing out on important information and messages. And, of course, missing out on messages from your audience that may be vital to respond to. When using social media monitoring effectively, it helps you boost your brand’s communication system and the way you listen and interact with your audience. In this article, we’re looking at 5 powerful reasons you need to Pay Attention to Social Media Monitoring. It’s vital that you know your audience and what they are about so you can market to them better, and provide them with a better customer experience. Therefore, social listening is something you need to use in order to collect the valuable information that is out there around your followers and brand. However, it is important that you know the difference between social listening and social monitoring. Broadly, it’s easy to understand why they are often mixed up, but it’s important to know that these actually have significant differences. Monitoring and listening are two practices that both play an important part of social media monitoring as a whole. Social media monitoring is more about customer service and customer experience, and taking action on these when something new appears, rather than extracting information from it. Social media listening is vital for your brand because it will allow you to gain a greater insight into what your audience thinks about your brand, and how their customer experience is as a whole. It will also let you identify any problems your customers have with your brand so that you can solve them immediately. Social monitoring, on the other hand, is more about engaging with your audience one on one and taking appropriate action based on the issues you see when you monitor the social media landscape that is circulating around your brand. These two are equally important and one should not neglect the other. Instead, they should complement each other when one isn’t covering the whole surface. When you identify and respond to your inquiries and messages, you make it easier for your audience to interact with you. At the same time, you are also showing that you are open for conversations. 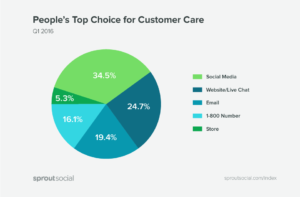 Customer service is seeing a huge change in the way people are using it, and today, more people than ever are using social media as a tool to reach out to brands and get customer service through. In fact, a study by SproutSocial found that 34.5% of customers prefer to reach out to brands through social media, and that’s quite a significant number and increase since a few years back. It tells us that customer service and being approachable on social media is extremely important for your brand. It also tells us that using social monitoring to identify and react to the messages is equally so. The big problem is that 90% of the messages people send brands go ignored! Imagine how much great potential of converting customers and building relationships that brands miss out on. With social listening, you can monitor the messages and jump in wherever necessary. In fact, when doing social monitoring on a regular basis, you’ll also be able to provide superior customer service quickly. Because brands have a serious problem with customer service on social media. Not only is it the fact that only 10% of messages receive a response. Those messages that do receive a response tend to be responded to after a much longer time than the customer expects from the brand. 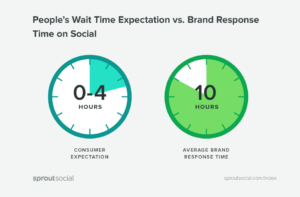 In fact, people expect brands to respond within 4 hours, but the sad truth is that the average response time for brands it 10 hours. When you respond to messages quickly, you’ll be presented as more approachable, and you might just encourage more people to reach out to them. Something worth having in mind is that responding to messages isn’t only important for coming off as more approachable. When you identify the messages who mention you, and that could benefit by you interacting with them, you’ll be able to improve your relationship with them, and as a result, their trust in your brand will also increase. No matter if it’s an angry or a positive message, they are both great opportunities for your brand. But without social media monitoring, finding them is extremely hard. Make sure you put great effort into both parts of the equation because your customer interactions work as a long-term relationship that will eventually lead to more sales. But without discovering the messages that are directed towards your brand, you don’t have any messages to interact with. One of the most important aspects of social monitoring is ensuring that you don’t miss out on any important messages. Or any messages targeted towards your brand, for that matter. Because no matter what the message is, you should take your time to acknowledge your audience and show that you care about them. As I mentioned in the beginning of this article, 9 of 10 messages go unanswered on social media. When I found out this, I cried inside, but I wasn’t surprised. That’s because I know how much it hurts a brand when they’re not responding to their customers. It sends signals that they don’t care about them and that they aren’t valuable to the company. While that’s very seldom the truth, the real truth is that the brand doesn’t have a clear social monitoring strategy and customer service plan that allows them to respond and engage with their customers at all, and in a timely manner. And that’s why social monitoring is so important. Even if someone just makes a post of your products without mentioning you, you should still jump in and engage with them – even if they don’t expect it, because the truth is that you’ll benefit from it, and you’ll surprise your customers positively. The most common messages that go unanswered by brands who don’t have a clear strategy on how to handle them, is comments. People are asking brands questions all the time in their comment sections but when you go through a few brand’s pages, very few people get responses. Responding to a question in your comment section can be the difference between a purchase and a returning customer, and an abandoned cart, or an escaping customer. Airlines are the type of businesses that are in the top when it comes to receiving the most customer questions, complaints, and inquiries, but unfortunately, most of them go unanswered. 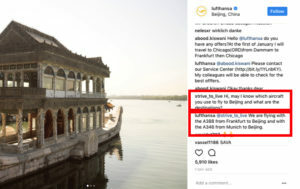 Only a very small portion of airlines have figured out how to use social monitoring, and manage their customer service on social media. 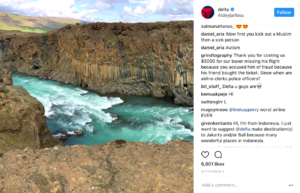 By just visiting an airline like Delta on their social media channels, you will see a ton of customer inquiries and unfortunately very few of them actually receive responses. And when you look at the questions people are asking, you can see that they could benefit from receiving a response. What’s more, the airline could benefit from responding, because it can mean converting an angry customer into a happy one again, but unfortunately, this rarely happens, because they don’t even receive a response from them. In fact, 91% of unhappy customers will not willingly do business with you again. However, if you resolve a complaint in the customer’s favor, they will do business with you again 70% of the time. That’s why social monitoring is so important. Not only will it help you build your relationships with your customers, but it will also directly reflect in your customer retention: how well you succeed in retaining your customers, although they had a bad experience with your brand. The key to avoiding missing out on important messages is knowing where to look and how to look. First off, you have your comment section. This is where most customers will contact you unless they share a post. Secondly, you have the usual @ mention. The problem with this one is that unless you are regularly checking your notifications, it’s easy for it to quickly disappear among your other notifications, thus leading to you missing it. Therefore, it’s important to check your notifications regularly, and have the resources demanded to be able to do so. Then, we have the hashtag. This is the way to join the discussion and community if you are sharing a post related to your brand. What’s great about hashtags is that the posts that are shared there never disappear. Most brands have a personalized hashtag that they encourage their audience to use, but remember that people might use some other hashtag when talking about your brand, so make sure you search for other hashtags your audience might use as well. Lastly, you also want to look for hashtags with misspellings. It’s easy to misspell a hashtag, especially if it’s long and complicated. And whether you respond to a customer post or not might be the deciding factor if they become returning customers or angry complainers. Just look at the hashtag “coccola”. It’s misspelled but still, has 24 thousand posts. That’s a lot to miss out on if you’re Coca-Cola. The “traditional” and “basic” way of using social media monitoring is to look at the conversations that are circulating around your brand. But how about the conversations that are circulating around your competitors’ brands? Understanding how your competitors are engaging with their audience and how they are managing their social monitoring can be extremely helpful. By monitoring the messages your top competitors receive, you can identify common pain points their customers are experiencing, and then incorporate solutions to those problems in your own marketing that speaks to those people. It’s easy to get carried away with a competitor that is managing social media monitoring well but make sure you don’t completely steal and copy their strategy. As a brand, you always want to do you, and create your own path rather than follow someone else’s because that’s how you end up in second place. You can also look at what your competitors are doing well. This will allow you to use some of their strategies on leaving their customers happy and satisfied. What’s more, you might also find some great tricks your competitors are using to convert angry customers into happy supporters again. Listening to what your audience is saying, and then taking proper action on social media is essential for building relationships and providing great customer service. With more people than ever now using social media, it’s natural that people choose it as their brand outreach tool. A lot of things are being said to and about your brand on social media and not listening to what is being said means missing out on great opportunities.